"A wonderful holiday pie, especially at Thanksgiving!" Finely chop cranberries in food processor or by hand. Spread into bottom of pastry-lined pie pan. In a large bowl beat eggs until frothy. Add sugar, corn syrup, melted butter or margarine, vanilla, mace, and salt. Mix well. Pour mixture over cranberry layer. 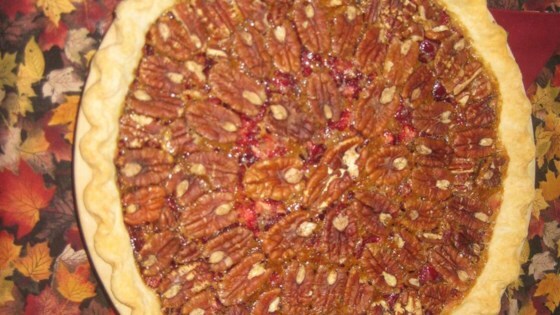 Neatly arrange pecan halves on top of sugar mixture. Bake in preheated oven for 45 to 50 minutes, until golden and set in center. I made this pie with very high hopes, but alas, I didn't like it at all. The combination of flavors just isn't to my taste. I love pecans, and I love cranberry, but not together. This recipe was so good. The cranberries helps the pie not to be too sweet. I definitely plan to make this during holidays .